With case studies from the USA, Canada, Chile, and other countries in Latin America, American Chinese Restaurants examines the lived experiences of what it is like to work in a Chinese restaurant. The book provides ethnographic insights on small family business, struggling immigrant parents, and kids working, living and growing up in an American Chinese restaurant. This is the first book to use personal histories to document analyze American Chinese restaurant world. New narratives by various international and American contributors have presented Chinese restaurant as a dynamic place that questions notions of identity, ethnicity, transnationalism, industrialization, (post)modernity, assimilation, public and civic spheres, and socioeconomic differences. 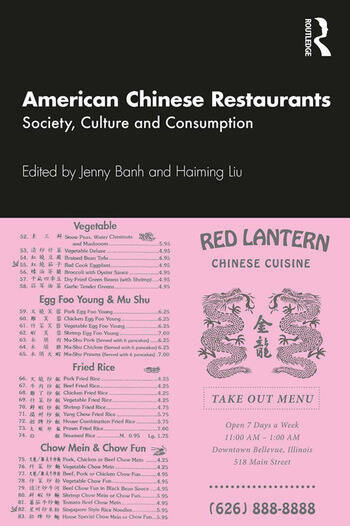 American Chinese Restaurants will be of interest to general readers as well as to scholars, college students from undergraduate to graduate level, who wish to know Chinese restaurant life and understand relationship between food and society. Carol Chan and Maria Montt Strabucchi. PROLOGUE: What Number did I get? Jenny Banh is an Assistant Professor at California State University, Fresno in Anthropology and Asian American studies. She received her BA from UCLA, MA from Claremont Graduate University, and PhD from University of California, Riverside. Her research focuses on Asia/Asian American studies, cultural anthropology, and popular culture. Her current research is on restaurants, barriers/bridges to minorities college students and a Hong Kong transnational corporation. She previously has published, Barack Obama or B Hussien (2012), DACA Spaces (2018), and co-edited Anthropology of Los Angeles: Place and Agency in an Urban Setting (2017). Haiming Liu is a world renown expert of Chinese transnational foodways and history. Haiming Liu is a Professor of Ethnic and Women Studies at California Polytechnic University, Pomona. He received his doctorate from University of California, Irvine. He is an expert in Chinese herbalists, food, restaurants, globalization and migration. He has authored From Canton Restaurants to Panda Express: A History of Chinese Food in the United States (2015) and The Transnational History of a Chinese Family: Immigrant letters, Family Business (2005).